SP’s, since 1964, has been renowned for filling the void in specialised publishing. Today, it is an enterprise also synonymous with ‘quality’. 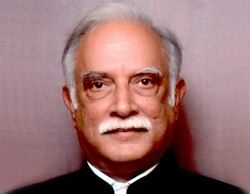 In 1964, Shri Sukhdeo Prasad Baranwal founded Guide Publications with the aim to arouse public awareness about the Indian armed forces through well-researched and incisive information. In the subsequent years, the Editor-in-Chief and Publisher, Mr Jayant Baranwal, renamed the organisation SP Guide Publications. The company today enjoys the repute of owning and publishing premier magazines in defence and all matters pertaining to military strategy of not just India, but across Asia. SP’s globally renowned flagship product, SP’s Military Yearbook was launched in 1965. International repute and worldwide readership received a further boost with the launch of SP’s Aviation in 1998, SP’s Land Forces in 2004, SP’s Naval Forces in 2006, SP’s Airbuz in 2008 and a recently launched SP's MAI. Today, together with the SP’s Military Yearbook, the five magazines have successively surged ahead of competitors with a slew of analytical, incisive and insightful articles. SP Guide Publications also offers its services in graphic designing, printing of the ultimate proven quality. Frontrunners in the field, a conscientious and persistent effort has been to promote, sponsor and communicate the celebrated events, shows and exhibitions related to the industry and defence services held in India and internationally. BizAvIndia – connecting the business aviation community. Founded in 1964, SP Guide Publications has been setting a trail-blazing path. In yet another first in the realm of defence and aerospace publishing in India, SP Guide Publications is partnering with the Business Aircraft Operators’ Association (BAOA), to keep the business aviation industry informed and connected. 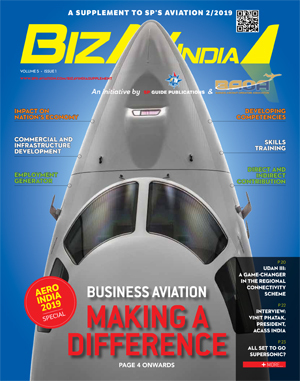 The partnership has seen the birth of ‘BizAvIndia’, a quarterly magazine which will be a supplement of SP’s Aviation. ‘BizAvIndia’ was launched on the eve of Aero India 2015 by the Joint Secretary of Civil Aviation, G.Asok Kumar in the presence of the Chairman and Managing Director of SP Guide Publications, Jayant Baranwal; the President of BAOA, Rohit Kapur; the President and CEO of General Aircraft Manufacturers’ Association (GAMA), Peter Bunce and the Director General of International Business Aviation Council, Kurt Edwards. ‘BizAvIndia’ features articles written by industry experts, journalists and senior officials. These articles are informative and analytical. ‘BizAvIndia’ will reflect current industry trends, discuss issues, connect the industry as to help achieve the fullest potential of the fast-growing business aviation sector in India. The feedback for the inaugural issue of ‘BizAvIndia’ has been very positive and we will be building upon that to be an effective platform for the nascent sector.